Kiwi is used internationally as the colloquial demonym for New Zealanders. Fiordland tokoeka (Apteryx australis ?) live in the remote southwest part of the South Island known as Fiordland. 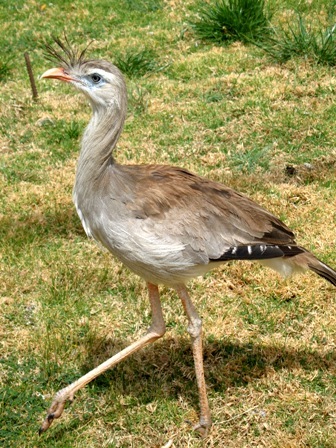 These sub-species of tokoeka are relatively common and are nearly 40 cm (16 in) tall. The Haast southern brown kiwi, Haast tokoeka, Apteryx australis ‘Haast’, is the rarest subspecies of kiwi with only about 300 individuals. 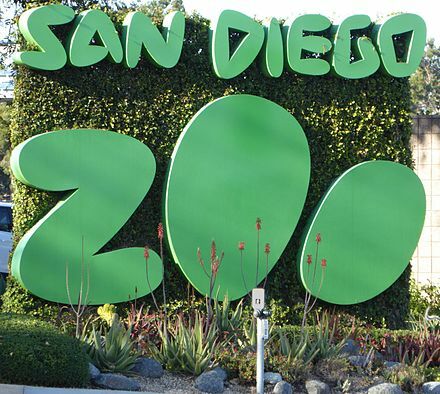 It was identified as a distinct form in 1993. It occurs only in a restricted area in the South Island's Haast Range of the Southern Alps at an altitude of 1,500 m (4,900 ft). This form is distinguished by a more strongly downcurved bill and more rufous plumage. Apteryx mantelli or Apteryx australis before 2000 (and still in some sources), is widespread in the northern two-thirds of the North Island and, with about 35,000 remaining, is the most common kiwi. Females stand about 40 cm (16 in) high and weigh about 2.8 kg (6.2 lb), the males about 2.2 kg (4.9 lb). The North Island brown has demonstrated a remarkable resilience: it adapts to a wide range of habitats, even non-native forests and some farmland. The plumage is streaky red-brown and spiky. 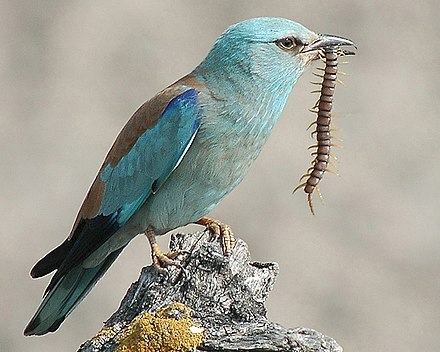 The female usually lays two eggs, which are incubated by the male. Kiwi eat small invertebrates, seeds, grubs, and many varieties of worms. They also may eat fruit, small crayfish, eels and amphibians. 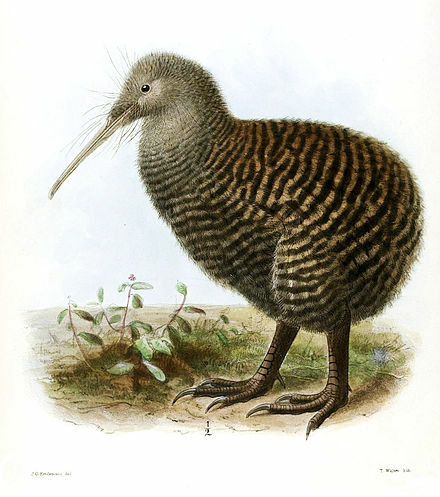 Because their nostrils are located at the end of their long beaks, kiwi can locate insects and worms underground using their keen sense of smell, without actually seeing or feeling them. This sense of smell is due to a highly developed olfactory chamber and surrounding regions. It is a common belief that the kiwi relies solely on its sense of smell to catch prey but this has not been scientifically observed. 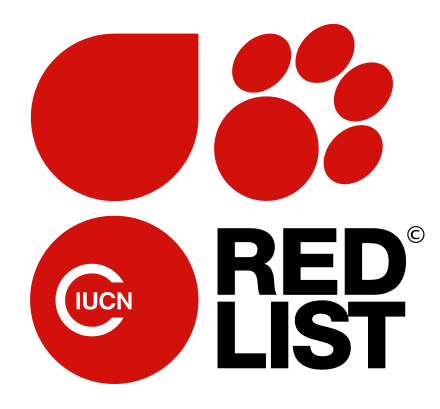 Lab experiments have suggested that A. australis can rely on olfaction alone but is not consistent under natural conditions. Instead, the kiwi may rely on auditory and/or vibrotactile cues. Kiwi falls after Wheeler talks down intervention, QE". The National Business Review. NZ. 27 October 2012. Retrieved 27 October 2012. 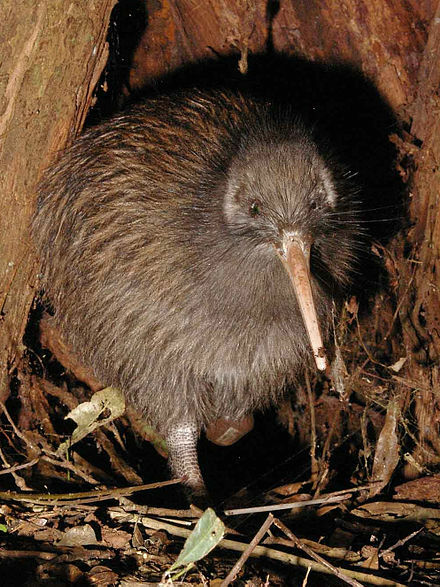 Kiwi genome provides insights into the evolution of a nocturnal lifestyle. Genome Biology 16:147-162. Kiwi Trust, archived from the original on 2 April 2012 . "Case studies on 1080: the facts", 1080 and kiwi, NZ: 1080 facts, archived from the original on 2 December 2011 .